Bradford’s Cassi Mead takes a shot during the first half of the Railroaders Division IV sectional tournament opener against Yellow Springs on Wednesday. Bradford advanced with a 65-29 victory. Bradford’s Abby Gade (1) sets up on defense against Yellow Springs’ Angie Smith (5) in a Division IV sectional tournament game on Wednesday at Brookville. The Railroaders advanced with a 65-29 victory. 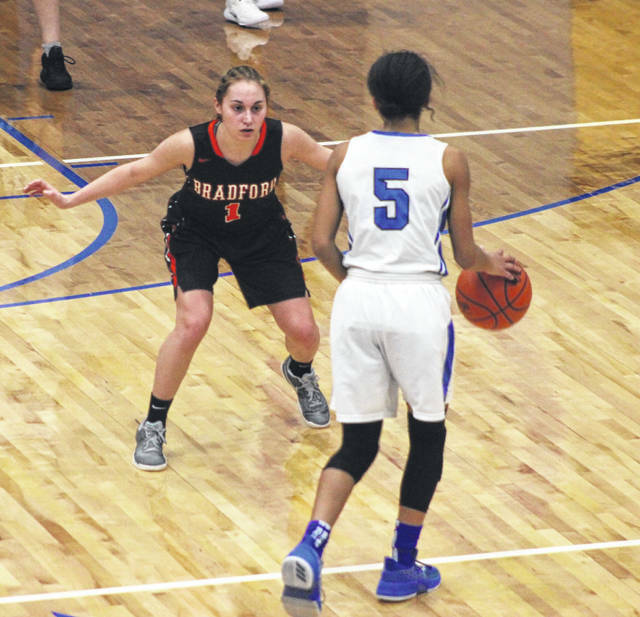 Bradford’s Austy Miller (4) brings the ball up the floor with Yellow Springs’ Haneefah Jones (4) on defense in a Division IV sectional tournament game on Wednesday at Brookville. The Railroaders advanced with a 65-29 victory. Bradford’s Bianca Keener (40) goes up strong surrounded by three Yellow Springs defenders in a Division IV sectional tournament game on Wednesday at Brookville. The Railroaders advanced with a 65-29 victory. 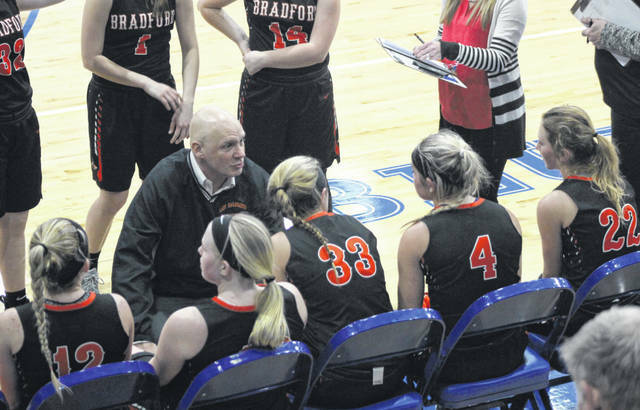 Bradford coach Chris Besecker talks with his team during a timeout in the second half of a Division IV sectional tournament game against Yellow Springs on Wednesday at Brookville. The Railroaders advanced with a 65-29 victory. Bradford’s Emma Canan (12) makes a pass during the first half of the Railroaders’ Division IV sectional tournament game against Yellow Springs on Wednesday at Brookville. The Railroaders advanced with a 65-29 victory. Bradford’s Rylee Canan (22) goes after a loose ball with Yellow Springs’s Angie Smith (5) during a Division IV sectional tournament game on Wednesday at Brookville. The Railroaders advanced with a 65-29 victory. BROOKVILLE – The Lady Railroaders were on track offensively on Wednesday night as they opened their Division IV sectional tournament with a resounding 65-29 win over Yellow Springs at Brookville. Bradford, the No. 6 seed in the sectional, rained down 3-pointers throughout the first half sinking nine total in the first 16 minutes to build a 42-12 lead at halftime. In fact, the first three shots that went through the net were all triples for the Railroaders causing Yellow Springs to call timeout with 5:05 left in the first quarter. Freshman Austy Miller drained the first trey of the game at 7:41. After a Yellow Springs bucket, Rylee Canan got into the act with a triple to from the top of the key go up 6-2. After another Yellow Springs hoop, Miller connected on her second triple of the game at 5:05 for a 9-4 Bradford lead. After the Bulldogs’ timeout, the Railroaders closed out the quarter on a 15-2 run that included two more treys, one by Cassi Mead and the other by Abby Gade to go up 24-6. 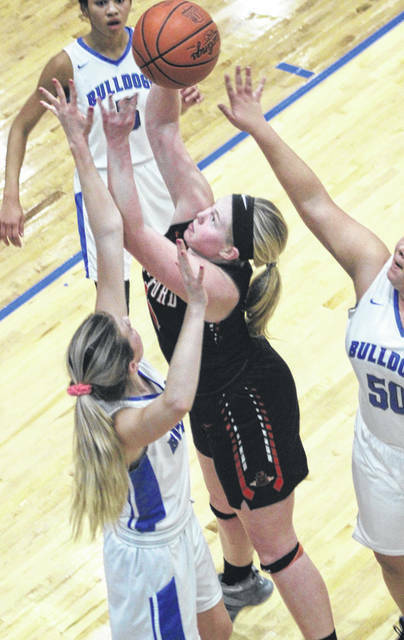 It was more of the same in the second quarter as the Railroaders scored 18 more points while holding the Bulldogs to 6 for the second straight period. But instead of Miller leading the charge like she did with 9 points in the first period, Mead was the point manufacturer with 5 in the second frame. The tournament victory was the first for the Lady Railroaders program since 2014, according to Besecker. 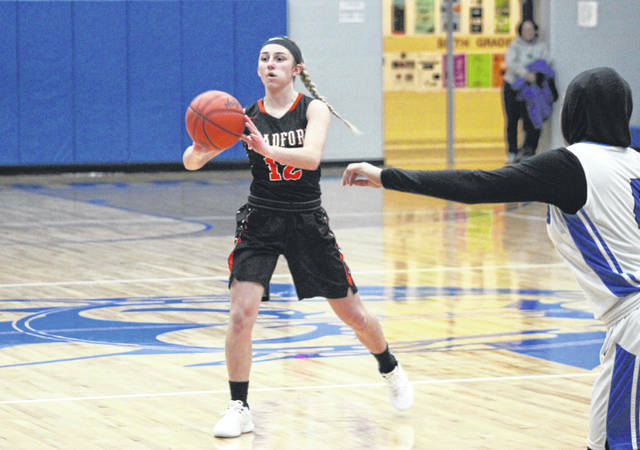 “It was our first tournament win since 2014, so it felt good to get another sectional tournament win,” Besecker said recalling the 2014 tournament win was a quadruple overtime thriller against Southeastern also at the Brookville sectional. 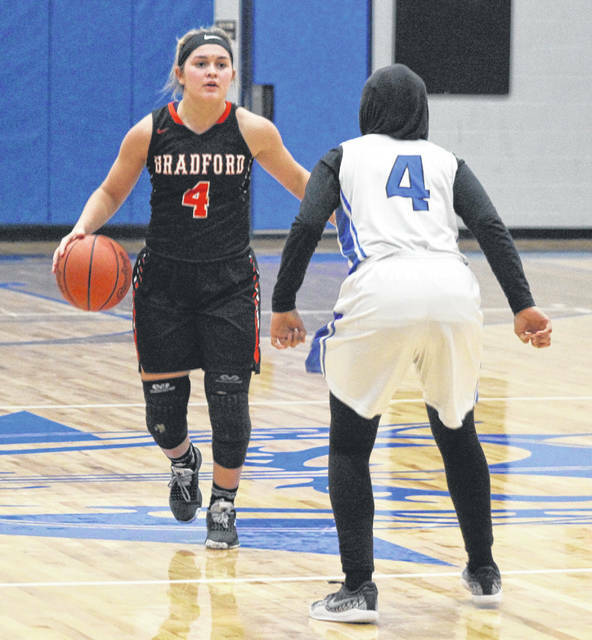 The third quarter was less impressive for Bradford only scoring 8 points to Yellow Springs’ 9 points, but the game was essentially already in hand by that point. 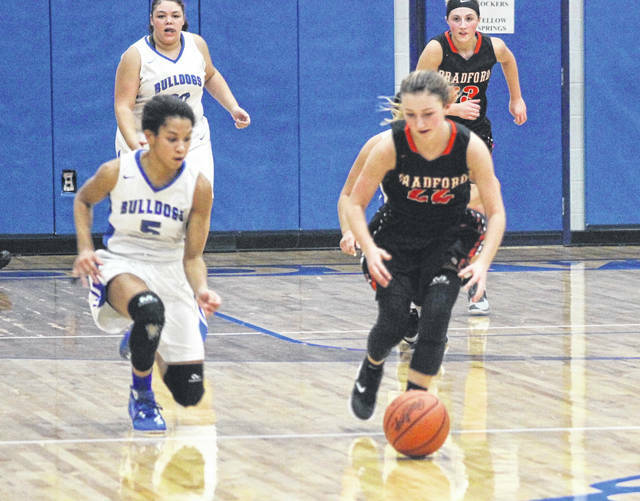 The Railroaders were re-energized in the fourth quarter with seven different players finding the scoring column to finish off the late-night victory. Miller led the way with 13 points followed by Mead with 11 as the only two BHS players to reach double figures. The Bulldogs were led by Angie Smith with a game-high 16 points. Nine players total scored in the game for Bradford. Gade, Bianca Keener and Rylee Canan contributing 8 points apiece followed by Emma Canan with 7, Abby Fike with 6 and Kendall Hill and Karissa Weldy with 2 each. “Cassi shot the ball well for us,” Besecker said. “Austy got in foul trouble in the first half and then got another quick one in the third quarter, but again our other kids stepped up. I thought both Abby Gade and Abby Fike came off the bench and played well too. Austy just plays so hard for us at both ends of the floor so she is going to run into some fouls sometimes. 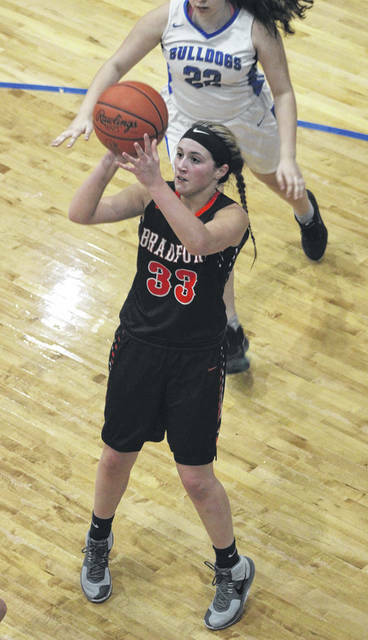 Bradford’s next tournament game will be at 7:30 p.m. on Tuesday, Feb. 19 against Springfield Catholic Central in the sectional semifinals at Brookville. Catholic Central beat East Dayton Christian in an earlier game on Wednesday. Bradford – Abby Gade 3 0 8, Kendall Hill 1 0 2, Austy Miller 4 2 13, Emma Canan 2 2 7, Abby Fike 3 0 6, Rylee Canan 2 2 8, Karissa Weldy 1 0 2, Cassi Mead 4 1 11, Bianca Keener 3 2 8. Totals: 23 9 65. Yellow Springs – Aaliyah Longshaw 2 0 5, Haneefah Jones 3 0 6, Angie Smith 8 0 16, Tyler Linkhart 1 0 2. Totals: 14 0 29. 3-pointers – Bradford 10 (Miller 3, Gade 2, Mead 2, R. Canan 2, E. Canan 1), Yellow Springs 1 (Longshaw 1). Records: Bradford (16-6), Yellow Springs (11-12).